The only thing she needs during nursing is quiet time. Being a mama is hard on the body. Every nutrient and calorie newborn kittens need comes from their mother's milk, meaning she needs to stay extra healthy to provide it. Supplements help correct vitamin and nutrient deficiencies, but typically are not necessary for most well-fed mama cats. You're no doubt familiar with the multivitamins and other supplements you take each morning to stay healthy. Although these may help offset the occasional diet of energy drinks and fast food, your cat most likely has a pretty steady, reliable diet of moist or canned commercial cat food. These commercially prepared foods typically offer all the important nutrients your cat requires, meaning extra supplementation usually isn't necessary, even during or after pregnancy. Cats are also susceptible to health problems if they get too much of certain vitamins, such as C and D, so adding supplements without consulting your vet may actually hurt your new mama cat instead of help. 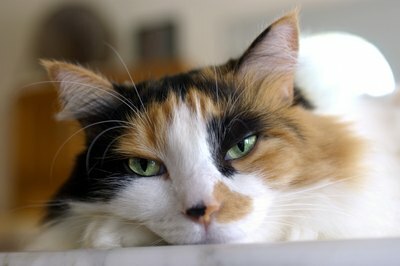 Put simply, your cat just needs to eat as much as she wants in the weeks after giving birth. Sounds like a pretty sweet deal, right? To feed her new brood of babies, your little mama needs to double or even triple her caloric intake. This helps her get all the important nutrients, vitamins and minerals she needs to keep herself healthy, and create plenty of good-quality milk to help her babies grow. Regular adult cat food typically won't offer her the levels she needs, but a high-quality kitten food will. Most pregnant cats are switched to kitten food about halfway through their pregnancies to encourage proper kitten development in the womb, and the amount per feeding is increased after delivery to aid in nursing. Her water intake typically increases as well, as she loses hydration through milk production and nursing. Just because kitten food offers pregnant and nursing mamas everything they need doesn't mean she can't still suffer a deficiency. Once the babies are out and her milk comes in, your little mama may suffer from eclampsia, which is a calcium deficiency. This essentially occurs when her parathyroid gland, which ultimately controls the amount of calcium in her bloodstream, malfunctions and doesn't tell her bones to release this important nutrient. After birth your cat's body signals the parathyroid that it needs even more calcium to help create milk for her babies, but a severe deficiency occurs instead, which can be life-threatening. Your vet will devise a treatment plan that may include IV calcium administration and oral supplements. Even though you can find all sorts of supplements for your cat online, in a variety of ranges and concoctions, this is not a do-it-yourself thing. Too much vitamin C can lead to urinary problems, and excess amounts of vitamin D and calcium are toxic to cats. Never start a supplement plan for your cat without speaking with your vet first, especially if your cat has just given birth or is about to. Generally speaking, healthy, well-fed cats don't require additional supplementation during nursing. If you suspect any medical problems with your mama cat, see your vet as soon as possible for proper testing and treatment. Her babies depend on her for their health, and she depends on you for hers. Don't self-diagnose or medicate. Speak with a vet. WebMD Pets: Cat Vitamins and Supplements: Do They Work? What Effect Does Grabbing a Cat by Its Scruff Have?